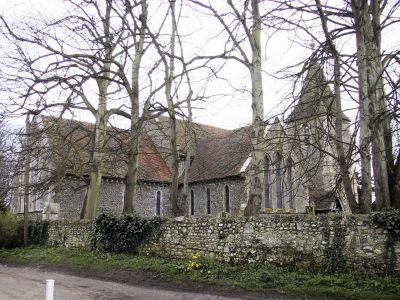 This page is taken from the Bognor Local History Society web site, but they are currently updating it to include more definitive articles on local churches in the area. Watch this space! The choir plus the vestry and Gallery at the West End date from the Victorian restoration. This church with its timber framed shingled spire stands on the edge of Pagham Harbour once a flourishing port in the Middle Ages. It stands on the site of the original Saxon church and some of the original stones can be seen in the South Transept built into an oak topped table. After 1066 a Norman church was built but the present church in Early English style, largely dates from the early 13th century some 40 years after the martyrdom of Thomas Becket. His crest of three birds can be seen above the porch as you enter the church. Inside, the immediate impression is of great width and largely white washed plainness. 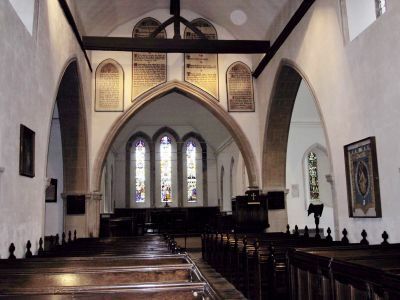 There is no chancel screen but above the arch are inscribed the Lords Prayer, the Ten Commandments and the Creed, as can be seen from the lower of the two pictures above. Please also visit http://www.stgeorgesnews.org/2001/03f11.htm for further details. Pagham, W Sussex, St Thomas a Becket (GF), 6, 7-2-7 in F#.